3 What are the Signs & Symptoms of Pyorrhea? 4 What are the Causes of Pyorrhea? 7 How to Prevent Pyorrhea? Pyorrhea is a serious gum infection and it is also known as periodontitis. It causes inflammation and destruction of the tissues as well as the bone available around the teeth. The condition mainly starts from gingivitis. Gingivitis stands for inflammation of gums and as a result of plaque formation because of poor oral hygiene. If gingivitis is not treated then it can result in periodontitis. There are no irreversible changes take place in gingivitis because it is a milder form of the disease. However, persistent inflammation can result in the formation of deep pockets between the teeth and gums. These pockets get filled with bacteria and plaque with the passage of time and begin to damage the bone and tissues supporting and surrounding the teeth. At the end of the day, the teeth lose grip and fall off. What are the Signs & Symptoms of Pyorrhea? What are the Causes of Pyorrhea? Who is at Risk of Getting Pyorrhea? 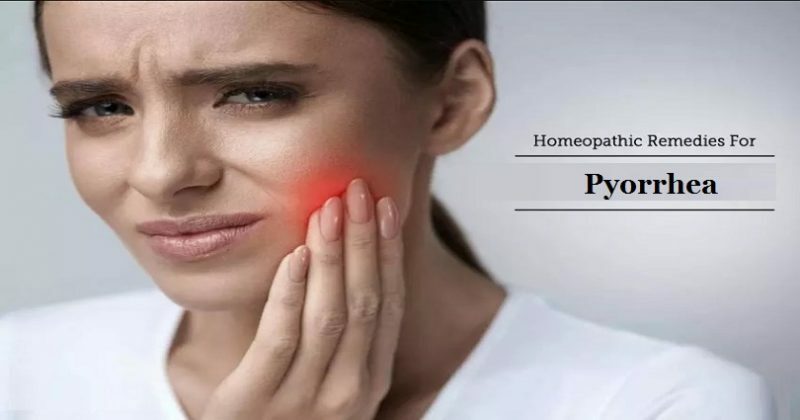 Homeopathic remedies give excellent results in dental problems including pyorrhea. There are a number of medicines to cure pyorrhea. The best homeopathic medicines for pyorrhea are Merc Sol, Kreosotum, Carbo Veg, Phosphorus and Lachesis. These medicines are selected on the basis of symptoms. The selection of medicine can be done after taking the complete case history of the patient. These medicines are natural that is why they are devoid of side effects. Merc Sol is the top rated homeopathic medicine for pyorrhea. The prominent symptoms to consider this medicine are swollen, tender and bleeding gums. The color of the gums may be bluish red. Attending symptoms are metallic taste in the mouth and bad breath. An increase in saliva may also be observed. Few people may also experience loosening of teeth in the sockets. In such cases, homeopathic medicine Merc Sol acts well as one of the best homeopathic remedies for pyorrhea. Homeopathic remedy Kreosote is renowned for its positive action on teeth and its surroundings. It supports the structures of the mouth in cases of pyorrhea. It is prescribed in cases where the prominent symptoms are bluish, puffy gums with an intensely putrid odor from the mouth. Bleeding of the dark blood from the gums is another feature to consider before prescribing this medicine among all the best choices for pyorrhea. The tooth of the person may be dark, decayed in such cases. Phosphorus is another homeopathic remedy to consider in the list of best homeopathic medicines for pyorrhea. It provides help in cases of pyorrhea when the gums bleed with ease. This medicine acts as an anti-hemorrhagic medicine. Soreness and pain in gums also experienced in cases of pyorrhea along with bleeding. The pain becomes worse from both cold and heat. Pain in the teeth may occur with the pain in gums. Carbo Veg is another ideal homeopathic remedy to cure pyorrhea and it is highly suggested where the gums of the person tend to bleed while brushing or cleaning the teeth. Usually, the gums have receded and are blackish in appearance and these symptoms are accompanied by teeth pain. Chewing of food makes the toothache worse. A bitter or sour taste in the mouth may be present in cases of pyorrhea where this homeopathic medicine gives excellent results. Lachesis is another homeopathic medicine for pyorrhea and it is beneficial when attended with swollen cheeks. The gums appear highly swollen and dark, purple in color. It is attended with burning in the mouth. Coppery or peppery taste in the mouth is another feature to consider. Homeopathic medicine Lachesis acts well in cases of pyorrhea when pain in the teeth extends to the ears. In such cases, Lachesis shows remarkable results. Note: Medicines mentioned here are for information purpose only. Kindly do not self-medicate. Fill the Comment Form below. You can write about your problem To Dr. Arsalan Rauf and receive a reply on How Homeopathy can help in treating your disease or illness.